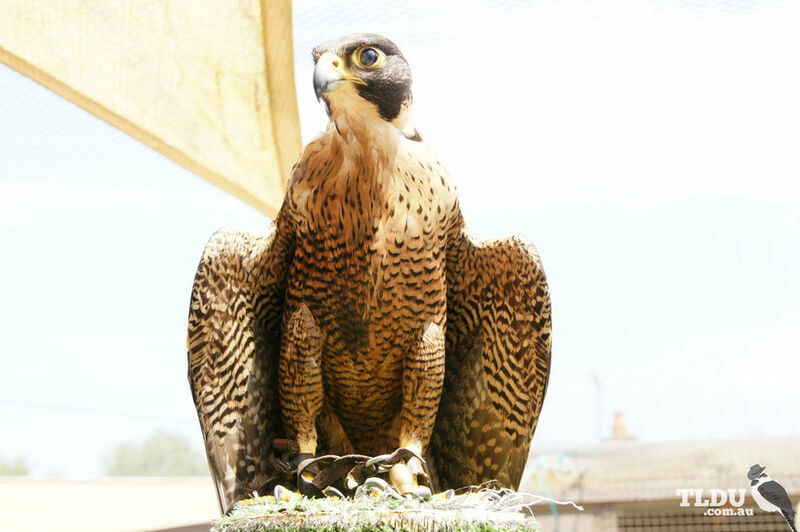 Peregrine Falcons are large, powerfully built raptors (birds of prey), with a black hood, blue-black upperparts and creamy white chin, throat and underparts, which are finely barred from the breast to the tail. The long tapered wings have a straight trailing edge in flight and the tail is relatively short. The eye-ring is yellow, with the heavy bill also yellow, tipped black. Although widespread throughout the world, it is not a common species. The Peregrine Falcon is often mistaken for the related Australian Hobby. However, this species has a different flight silhouette, with a curved trailing wing-edge, and lacks the full black hood. The Peregrine Falcon is found across Australia, but is not common anywhere. Largely resident, with young birds roaming at random until they are ready to breed. The Peregrine Falcon feeds on small and medium-sized birds, as well as rabbits and other day-active mammals. It swoops down on its prey from above, catching or stunning it with its powerfully hooked talons, before grasping and carrying it off to a perch to pluck and eat it. It will pursue flying birds, being able to fly at speeds of up to 300 km/h, and it soars to a great height in search of prey. Pairs may hunt co-operatively, with one member, usually the male, scattering a flock of birds while the other swoops down to attack a particular individual. This co-operative behaviour is most often observed during the breeding season. The Peregrine Falcon mates for life and pairs maintain a home range of about 20 km to 30 km square throughout the year. Rather than building a nest, it lays its eggs in recesses of cliff faces, tree hollows or in the large abandoned nests of other birds. The female incubates the eggs and is fed by the male on the nest. When the young have hatched, both parents hunt to provide food. Young Peregrine Falcons disperse widely, but often return to their original home area to breed when mature. Pesticides have been found to thin the eggshells of Peregrine Falcons, decreasing their nesting success in some areas. However, although these birds are not common, they have successfully spread worldwide, and will sometimes nest on artificial structures such as the window ledges of high buildings.